The Berkeley Lab Laser Accelerator (BELLA) has boosted electrons to an energy of 4.2 GeV, setting a new energy record for these ultra-compact accelerators. Conventional particle accelerators use RF driven metal cavities to impart energy to particles. Those can reach accelerating gradients of tens of MV per meter, resulting in rather long machines if energies in the GeV range are desired. Laser-plasma accelerators (LPAs) can reach accelerating gradients of tens or even hundreds of GeV, not mere MeV, per meter. Electron beams with an energy of greater than 1 GeV were produced by the LOASIS Laboratory here in ATAP in 2006. That success led us to propose the Berkeley Lab Laser Accelerator (BELLA). With that more powerful laser, as well as refined techniques like pre-forming the plasma, BELLA has accelerated electrons to more than 4.2 GeV using a 9 cm long capillary: an average gradient of almost 50 GeV/m. Extensive simulations using INF&RNO, a code developed in ATAP for modeling laser-plasma interactions, showed that the experiment and causes of fluctuations in beam energy and charge are well understood. These fully self-consistent, multi-dimensional particle-in-cell (PIC) simulations ran on the Cray XC30 supercomputer “Edison” at LBNL’s National Energy Research Supercomputing Center (NERSC). They were of fundamental importance in modeling the propagation of an high-intensity laser in the plasma, characterizing the nonlinear wakefield excitation, and studying the details of particle self-trapping. The results were important in planning the experiment and also in helping us understand the results. PIC simulations of these laser-plasma interactions are usually very computationally demanding; each simulation requires in the range of ten thousand to a few millions of CPU-hours, depending on the particular problem. The computational power of “Edison” allowed us to perform extensive parameter scans, facilitating our understanding of the physics. “Power to the Electrons,” a Viewpoint article by Georg Korn of Europe’s Extreme Light Infrastructure project, puts the achievement in context. It appears in Physics, an American Physical Society publication that spotlights exceptional research from APS journals. This article by Matteo Rini, Deputy Editor of Physics, looks at the x-ray free-electron lasers of today and tomorrow, and where laser plasma accelerators and a next generation of our facility, “k-BELLA,” might fit in. A concise summary in Nature Research Highlights. The technical paper announcing this result: W.P. Leemans, A.J. Gonsalves, H.-S. Mao, K. Nakamura, C. Benedetti, C.B. Schroeder, Cs. Tóth, J. Daniels, D.E. Mittelberger, S.S. Bulanov, J.-L. Vay, C.G.R. Geddes, and E. Esarey, “Multi-GeV Electron Beams from Capillary-Discharge-Guided Subpetawatt Laser Pulses in the Self-Trapping Regime,” Physical Review Letters 113, 245002 (8 December 2014). Further information about our laser-plasma accelerator efforts may be found at the BELLA website. The news of this latest BELLA achievement has garnered widespread coverage, including a story provided to newspapers by the wire service UPI, and articles in trade-news and popular websites such as GizMag.com, Engineering.com, TechTimes.com, ZMEScience.com, Sci-News.com, RedOrbit.com, NextBigFuture.com, MarketBusinessNews.com, and ElectronicsWeekly.com. Scientific American blogger Jennifer Ouellette named the PRL to her 10 Best Physics Papers of 2014 list. APEX, the Advanced Photoinjector EXperiment, recently passed a major technical review and will soon be ready to run again. APEX Phase I installed in the Beam Test Facility at LBNL’s Advanced Light Source. This view looks “upstream” and shows the two yellow cylinders of the two-slit emittance measurement system, part of the instrumentation that measures the beam parameters. The large silver cylinder is the face of the electron-gun housing. 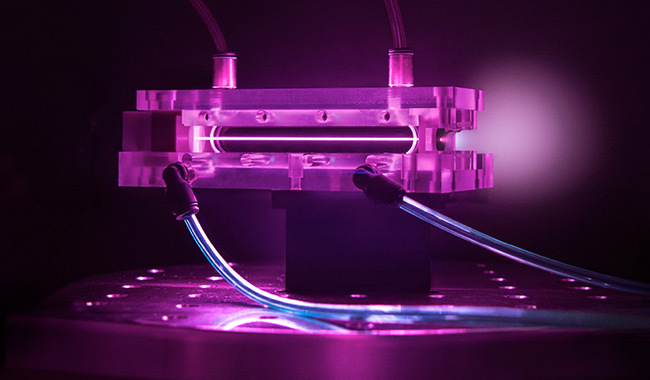 Located in a shielded cave at the Advanced Light Source, APEX is a prototype high-brightness and high-repetition-rate electron source designed to meet the performance demands of an injector for use in a high-average- power free-electron-laser-based light source. It is the basis for the injector design for LCLS-II at SLAC National Accelerator Laboratory, a project in which SLAC is collaborating with ourselves, Fermilab, Jefferson Laboratory, and Cornell University. In August, APEX suffered a breakdown in one of the two coaxial RF power feeds to the cavity, causing a shutdown of the experiment. Following the event, the gun was removed and repaired, and the causes of the breakdown were studied and mitigation plans developed. To ensure that possible problems were understood and mitigated before experimental results resumed, James Symons, Associate Laboratory Director for Physical Sciences, requested that ATAP Director Wim Leemans and Engineering Division Director Kem Robinson organize a readiness review. The committee was chaired by Claude Lyneis, a retired senior physicist from LBNL’s Nuclear Science Division, and included Patrick Bong, Slawomir Kwiatkowski, Alessandro Ratti, and Will Waldron of LBNL and Erik Jongewaard of SLAC. They met on October 27 and concluded that the APEX team had recovered quickly and had addressed all problems professionally and effectively. A silver lining in the cloud of the downtime for APEX is the opportunity to implement improvements in the cavity inner components which would otherwise remain inaccessible. These include use of a novel technique of dry-ice cleaning of the radiofrequency surfaces, along with careful polishing, to minimize particulate contamination and surface roughness that can cause field emission. Now that the repairs have concluded and a number of changes in hardware and procedures are in place, start-up plans have been developed with a detailed check list. Environment, health, and safety considerations were reviewed and deemed to be consistent with the Lab’s Integrated Safety Management plan. The committee made some recommendations to be implemented before start-up (fast interlocks; power-testing of the high-power circulators; synchronization of diagnostic channels) and also some logistics recommendations such as documentation and time allocation of needed staff. We look forward now to full re-commissioning, completing the emittance measurements required for LCLS-II, and future applications in ultrafast electron dynamics. Visit the Special Projects Section page on the ATAP website. Shown above is a prototype LCLS-II undulator installed in the magnetic measurement facility at LBNL. The main features are magnetic modules and a strongback structure to position them — and move them upon command — with micron accuracy in the face of tens of thousands of kg of magnetic repulsion. Each LCLS-II undulator array will consist of several individual sections like this one. The Linac Coherent Light Source-II (LCLS-II), a major project at SLAC National Accelerator Laboratory, involves ATAP and allied parts of LBNL. Key ATAP and Engineering Division contributions to this free-electron-laser facility include the design of the electron gun (closely related to the APEX experiment) and of the undulators. Both items were judged favorably in recent Design and Milestone Reviews. Matthaeus Leitner of LBNL’s Engineering Division reported on behalf of reviewers Andrew Ringwall (SLAC), Alexander Temnykh (Cornell), and James Rank (Brookhaven). They found that the undulator had progressed well beyond the preliminary design stage, which was the basic requirement at this point. For example, the design already takes into account the higher repetition rate and therefore higher radiation doses (permanent magnets get slowly demagnetized by radiation) of the recently revised design. The committee approved the current undulator design, with some minor action items and observations to be taken into account. A prototype of the undulator has allowed a wide range of measurements of its effect on the electron beam, as well as testing of mechanical systems. The committee encourages more-refined testing, both with the prototype and with analytical models. A separate review committee studied the design proposed for the LCLS-II Injector Source Electron Gun and Cathode Load Lock. Ali Nassiri of Argonne National Laboratory’s Advanced Photon Source reported on behalf of a committee that included Chris Adolphsen, Erik Jongewaard, and John Schmerge of SLAC, Ken Chow and Adrian Hodgkinson of LBNL, and Robert Rimmer from Jefferson Laboratory. The technical scope of the project was found to meet the requirements and is principally awaiting measurements from APEX. Overall the committee deemed the design mature enough for preliminary design approval. A particular area of expertise in ATAP is the radiofrequency quadrupole accelerator, or RFQ. Together with our colleagues in the Engineering Division, we have been designing and building RFQs for some 30 years. Recently we developed an RFQ of demanding specifications for the Institute of Modern Physics in Lanzhou, China. The ATAP and Engineering Division developers of the RFQ for IMP Lanzhou with their handiwork: (l-r) lead engineer Steve Virostek, Allan DeMello, principal investigator Derun Li, Tianhuan Luo, John Staples, Matt Hoff, and Andrew Lambert. Presently the highest-intensity proton RFQ in operation, this unit achieved 10 mA of beam current at 2.1 MeV in November 2014. It will be part of a waste transmutation project. The RFQ will be a key part of a system that they are developing to transmute reactor waste into shorter-lived forms. This unit achieved 10 mA of beam current at 2.1 MeV this November in Lanzhou, making it the highest-intensity RFQ in operation. We are also working on a similar RFQ for PIP-II, the Proton Improvement Plan at Fermilab, a centerpiece of their plans for high-energy and nuclear-physics research. This RFQ is expected to be delivered in Spring 2015. LBNL is getting these devices thanks in part to the Physical Sciences Workplace Life Committee, which, about two years ago, suggested the purchase of a few AEDs to be installed at central locations such as Building 50 and the Advanced Light Source. The idea was expanded to labwide rollout, and the committee members, including ATAP’s Greg Penn and Ina Reichel, have been recognized with the Safety Spot Award for their effort and initiative. The AEDs will be installed by the end of January; one will be near the main entrance of the Building 71, Room 264 conference room. Locations will be announced and of course indicated by signage. There will also be some loaner AEDs which can be requested and kept nearby when, for instance, electrical work is being conducted. If you take a cardio-pulmonary resuscitation (CPR) class at the Lab, it will include training on how to use an AED, although they are inherently intended for emergency response by passers-by and designed to be user-friendly. The CPR class also teaches several other techniques that can save a life when AEDs are inapplicable or unavailable. Go to training.lbl.gov to learn about CPR, first aid, and a wide variety of other classes that the Lab offers. The Physical Sciences Workplace Life Committee works on diverse issues affecting workplace life in ATAP and the Nuclear Science, Physics, and Engineering Divisions. Besides AEDs, issues the committee has looked at include the visa process at the Lab for scientists from abroad, parking, and telecommuting. The committee invites your idea; you can use the online suggestion box or talk to Ina or Greg.